Bartholomew Neil’s mother has just died of brain cancer and he’s uncertain what to do next having lived with her for all of his thirty eight years. When he finds a ‘Free Tibet’ letter from Richard Gere among his mother's possessions he becomes preoccupied with the actor’s influence on his mother’s life. In a bid to get his thoughts down on paper he begins writing a series of intimate letters to the actor chronicling the bizarre twists and turns his life is beginning to take. From his relationships with a defrocked Catholic priest and his new grief counsellor Wendy, to the beautiful, mysterious Girlbrarian and her oddball brother, Max, Bartholomew soon realises that he is not alone in living an unconventional life. 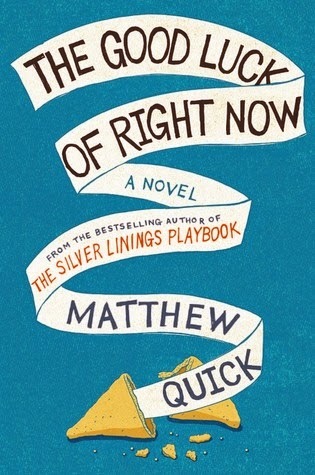 Following the success of Silver Linings Playbook (a book I really enjoyed), I wasn’t sure what to expect from Matthew Quick’s second novel for adults. I quickly found that The Good Luck of Right Now is a similarly enjoyable story. Quick introduces us to another likeable but troubled central character in Bartholomew. While he doesn’t necessarily have obvious mental health problems Pat did in Silver Linings Playbook, he still struggles with anxiety and low self-esteem manifested through the ‘angry man in his stomach’. Like Pat though, he is an articulate narrator whose letters reveal him to be a deeply sensitive man trying to find his place in the world. Bartholomew learns to find strength in his mother’s belief in ‘the good luck of right now’, namely that when something bad happens to you, it is balanced out by something good happening somewhere else in the world. Quick’s characters have certainly seen their fair share of bad fortune having been abused, bereaved and lied to for most of their lives and there is something touching in how Bartholomew chooses to deal with what life has thrown at him. There is a certain level of absurdity to Quick’s storytelling which reminds me somewhat of Chuck Palahniuk, though unlike Palahniuk’s writing, the darkness remains a little beneath the surface. Both novelists are able to find great humour is undesirable situations, and there were a number of times I found myself laughing out loud at Bartholomew’s letters. The book seemingly ends on an upbeat and hopeful note, though the author teasingly brings into question the reliability of his narrator at the end of the story. If you enjoyed Silver Linings Playbook, this is another charming and humorous story.